Concentrations and loads of water-quality constituents in six streams in the lower Delaware River Basin of New Jersey were determined in a multi-year study conducted by the U.S. Geological Survey, in cooperation with the New Jersey Department of Environmental Protection. Two streams receive water from relatively undeveloped basins, two from largely agricultural basins, and two from heavily urbanized basins. Each stream was monitored during eight storms and at least eight times during base flow during 2002–07. Sampling was conducted during base flow before each storm, when stage was first observed to rise, and several times during the rising limb of the hydrographs. Agricultural and urban land use has resulted in statistically significant increases in loads of nitrogen and phosphorus species relative to loads in undeveloped basins. For example, during the growing season, median storm flow concentrations of total nitrogen in the two streams in agricultural areas were 6,290 and 1,760 mg/L, compared to 988 and 823 mg/L for streams in urban areas, and 719 and 333 mg/L in undeveloped areas. Although nutrient concentrations and loads were clearly related to land useurban, agricultural, and undeveloped within the drainage basins, other basin characteristics were found to be important. Residual nutrients entrapped in lake sediments from streams that received effluent from recently removed sewage-treatment plants are hypothesized to be the cause of extremely high levels of nutrient loads to one urban stream, whereas another urban stream with similar land-use percentages (but without the legacy of sewage-treatment plants) had much lower levels of nutrients. One of the two agricultural streams studied had higher nutrient loads than the other, especially for total phosphorous and organic nitrogen. This difference appears to be related to the presence (or absence) of livestock (cattle). 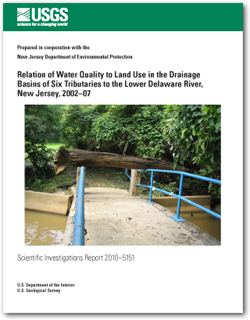 Baker, R.J., and Esralew, R.A., 2010, Relation of water quality to land use in the drainage basins of six tributaries to the lower Delaware River, New Jersey, 2002–07: U.S. Geological Survey Scientific Investigations Report 2010–5151, 68 p.